Thank you for many warm words and endorse! As the strings file name of some languages is English, renaming it to the proper language name when used with this tool. Version 1.3.6 released. This is mainly minor improvements and bug fixes. Thank you for your positive feedbacks and endorsements. Happy modding! Many tanks for this awesome tool ! Saved me a lot of time for my next skaal mod !!! Endorsed !!! This is an invaluable tool. Thank you! Thanks danexuslurker, have a FUN! 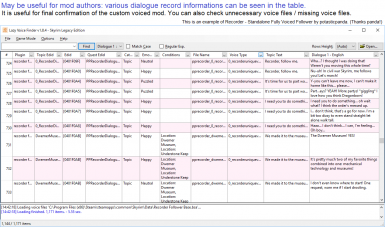 I'm making a custom-voiced follower mod right now, with scenes to interact with other followers by re-using vanilla dialogue, and this tool makes it a million times easier! Fantastic work - thank you! Hey! Finally released my new follower, Lucien! Your tool was incredibly helpful all the way through the process - I can't thank you enough. Wow, congrats on release your follower mod! I love custom followers with back story and custom voices. If there is intaract with other followers, there is no choice but to try Thanks for letting me know. "[19:37:31] Error: Invalid bsa/ba2 format. (LZ4 decode failed) Could not load file or assembly 'file:///C:\Users\rt\apps\LazyVoiceFinder\Lib\lz4.x86.dll' or one of its dependencies. Operation is not supported. (Exception from HRESULT: 0x80131515)(FileLoadException) (TesException)"
I loaded Sofia Follower and everything works, so the issue is Recorder Follower. Could someone please figure out the problem and find a fix. Sorry, I forgot to mention in the description. It seems that runtime dll for extracting SSE BSA is not installed. I have "Microsoft Visual C++ 2015 Redistributable Package (x86)" already installed on my computer, but just to be sure, I uninstalled it and reinstalled the version from the link. This dose NOT fix the problem. 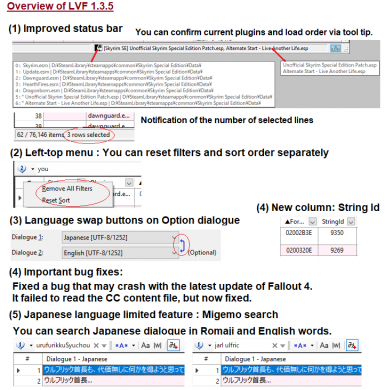 This tool works fine on Sofia, Ambriel, Dawnguard DLC and others, but not on Recorder follower. Am I the only one having this issue? Hi again decarter, I'm sorry to trouble you. This error occurs when reading BSA files of SSE (Newer format than Oldrim) and there is no dependent dll of lz4.x86.dll. 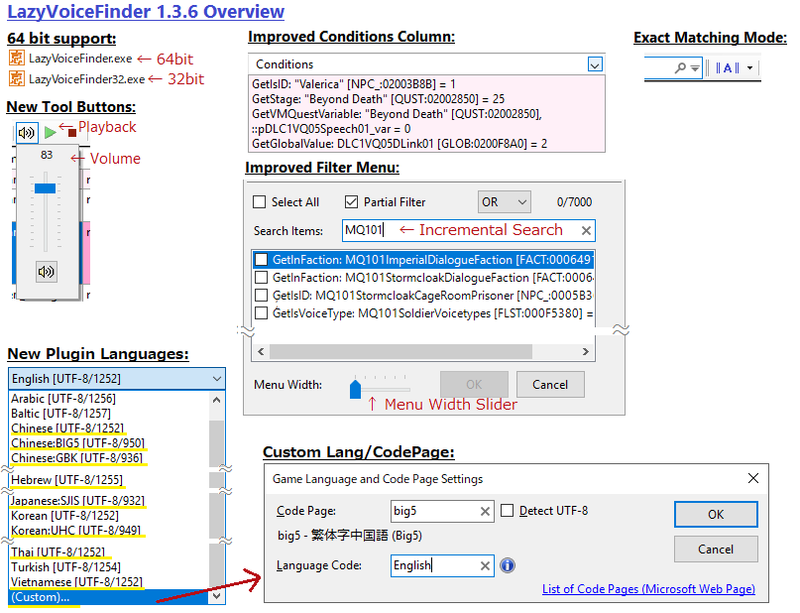 On my win10 PC, LVF 1.3.5 can read bsa of Recorder SSE and it should work if VC ++ 2015 Runtime (x86) is installed. - Is LVF version is 1.3.5? If you update from an older version, do not overwrite the old file and install it in a new folder. 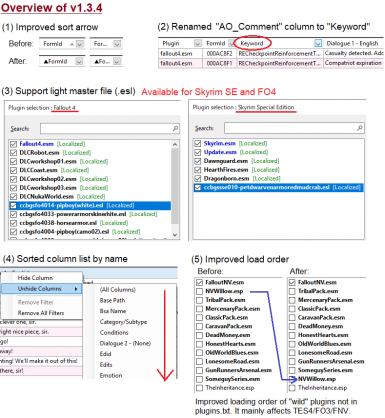 - How about SSE mods other than Recorder (BSA compressed mods)? I think this is the so-called "DLL dependent hell" problem. it is a very troublesome as even if my program does not use the runtime DLL but there is always the possibility that other libraries will be used. If trying the above does not work, please install VC ++ 2013/2012/2010 Runtime x86 in order (Yes, this is the runtime that installed my PC). Hello BowmoreLover, it's not trouble at all from my side. I appreciate you helping me with this, thank you. I have all those VC ++ installed, but again I uninstalled and reinstalled them in order like you said. - My LVF is 1.3.5 and it's a clean install because I did't have any previous versions, I download it first time in August. 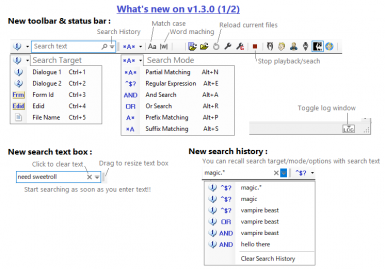 - I tried it with Forgotten City and Helgen Reborn and it works fine. 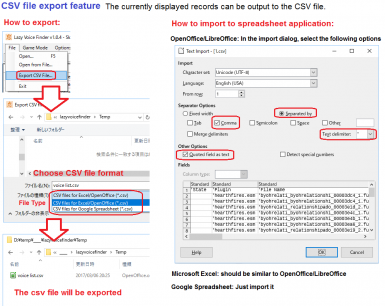 - Today, I extracted the Recorder follower BSA and then loaded it with "Open from file...", and it worked. This workaround is all I need. This is a great tool, I'm going to use it a lot for what I'm working on. If you are still tweaking this tool, maybe a play button next to the stop button would be great. I do not know the reason why only bsa of Recorder can not be read. I tried Recorder SSE 3.0 and Oldrim version but it did not reproduce. I will upgrade the lz4 library in the next version, so it may be fixed with that. >If you are still tweaking this tool, maybe a play button next to the stop button would be great. Thank you for the suggestion. I added it to my TODO list. I am working on the next update (many improvements), so I will add it as well. It will take some time before release, please look forward to it. - Closing and relaunching the program wouldnt even fix it ? Thanks in advance, looking forward to use your FANTASTIC tool to its full potential ! Please open "Options - General Settings" menu. There are several options that may be relevant to your situation. 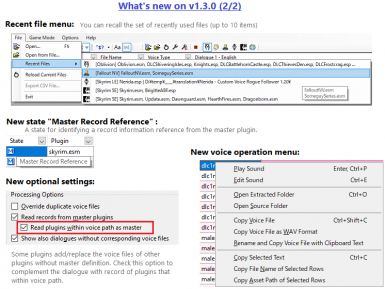 - "Read records from master plugins" : It reads the relevant dialog records from the master plugin of the plugin of your choice. The default is on. If this option is off, only the plugins of your choice will be loaded. Incidentally, this option is to complement the information on the spreadsheet by reading related records from master plugins and will never load the master dialogues unless you choose it in the plugin list. 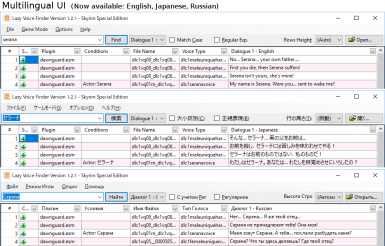 - "Ignore loose voice files in Data folder" : LVF also lists "orphan" voice files (That is, voice files without corresponding dialogue records). 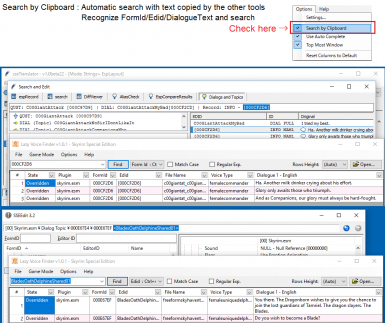 If a loose voice file unrelated to the loaded plugin exists in the Data folder, those files are also listed together. If you turn this option off, you will completely ignore the loose file in the Data folder. To know exactly the list of loaded plugins, see the tooltip in the status bar at the bottom of the main window. 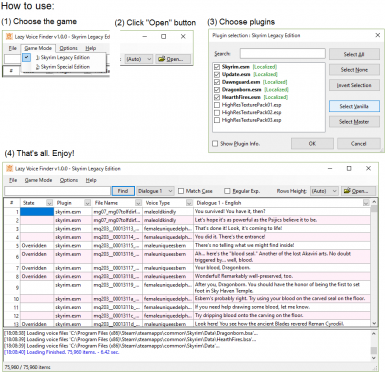 In the tooltip of game icon, all loaded plugins will be listed. The plugin you choose will be indicated by the leading '*'. A plugin not prefixed with '*' is read as a master. - I m totally ok and understanding the master/dependencies functionalities (by default i would load the master file), and the loose files option too, which are some "loose" dependencies in some way... the "issue" is when you choose to open one selected file, it would not only open that file (and eventually the master files and associated files depending on the choice your answer mention) but also... ANY OTHER SINGLE FILE THAT HAVE BEEN OPENED PREVIOUSLY AND THAT HAVE NO RELATION/DEPENDENCIES EVER WITH THAT FILE (sorry for caps lol ). As a result, this create a GROWING LIST OF "SINGLE OPENED" FILES WHICH ALL LOADS TOGETHER AFTERWARD, making then less relevant the option to open one single file. Closing the program wont change that and wont clean/empty that list. Checking/unchecking "remember selection" wont do it either. May be its more clear for you now ? i think it looks like a glitch / unrefreshed data or some uncleaned ini file ? - That beeing said, i ve found the work around since my post : on top of the plugin tab, clicking the plugin small arrow would let me select only the plugin of my choice and filter the DISPLAY to work on it, but still... all others plugin are loaded and the list keeps on growing etc. This is not a major issue but since its glitch (if i m not wrong) a growing undefinitly list could cause some memory problems for some configs. - Made me learn a bit of SSEEdit to remove those comments in the RDO esp and clean/edit the generated reference errors and have it 100% clean and working in game like a charm. Thank you for detailed explanation, fully understand. Sorry for the inconvenience. OH.. it's not my intention at all!!! Every time a single file is opened, the previous file is also loaded and the list is growing, right? Seems to be a bug as you say, but since my bug not reproduced on my PC (probably depends on the user's environment), so I have to find the possibility of a bug with follow the source code. - Although it is said that it will occur even if the tool is restarted, when you restart the tool and open a single file first time, will the plug-in loaded at the last startup be loaded? I'll try to fix it in the next update but now I'm in a major overhaul of tools so it will take a little bit of time. "Thank you for detailed explanation, fully understand. Sorry for the inconvenience. OH.. it's not my intention at all!!! Every time a single file is opened, the previous file is also loaded and the list is growing, right?" "- Although it is said that it will occur even if the tool is restarted, when you restart the tool and open a single file first time, will the plug-in loaded at the last startup be loaded?" >>> Nothing is reloaded if you close and restart the program. When you select a new file to open, it will load and also all from the previous "single open" session of the program (including after PC restart etc etc). On the bottom, only the loading process informations of the current selected file appear , but the other files are trully loaded, can be sorted and sound can be played in tab etc. "- When that happens (when an unexpected plug-in is loaded), does the status bar tooltip at the bottom of the screen contain plug-ins that you have not selected? (Mouse over the plugin name of right of the icon)"
>>> Question : sometimes a selected file wont open : is it because it has no voice reference in it ? since no information appear on the bottom, i dont know if it fails to open (bug) or if its normal because it has no audio in it ?. Not sure of that... but worth looking at some stupid language/system glitch may be ? Absolutely top notch piece of software! You made Creating my own PC Headtracking Voice Pack easy! Thank you! Thanks BlueGunk, I am glad to hear that. Happy modding!!! Thanks Redd, just enjoy it! OH MY GOD this is a wonderful tool! Being able to listen to the sounds without extracting them is just priceless - saves time and space. If I had this before I would have built Teldryn Serious in less time, but still, THANK YOU! It will make my work less time consuming! Undriel, thank you for your kind words. You did a wonderful job on this, thank you so much for making it. 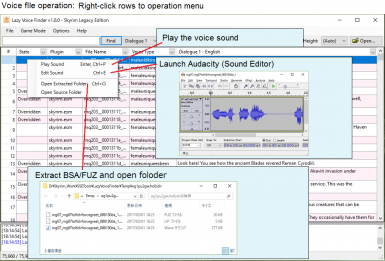 The ability to click on a file and the program automatically extracts the .fuz, .lip, and .wav files is a huge time saver. I also love that you can group different voice types together. Wish I had found this tool earlier when making quest mods. Endorsed and you've got my vote for file of the month. Thanks again! Thanks for continuing to update this tool, I use it all the time. Just downloaded v.1.2.4, works great. The hide/unhide columns feature has a whole bunch of filtering options I didn't even realize existed before. Bravo! If you're continuing to tweak this, the only thing I can think of to make it even easier to use would be the following feature: right-click on the dialogue text, and the menu pulls up an option called "copy dialogue text to clipboard", and then I could paste the text straight into Creation Kit. I was afraid that it would make look complicated so I could not put this operation in the menu, but I may have to reconsider as I asked the same questions as you did several times. I will definitely improve on the next version. Thanks for good suggestion! Thanks, tried Ctrl+C, it's working. This looks VERY useful! I'm currently building my first very own mod (house mod with attached quests), and I am planning to splice Vanilla dialogue to "voice" the quest as I don't have any voice actors at my disposal (and finding good ones that aren't up to their noses in work from other projects such as Interesting NPCs is probably going to be difficult for a new modder such as myself). I had been hoping a tool like this would be available to help me find the right lines when I get to doing the quest, and voilà, here you upload exactly what I'm looking for. Thanks, tracking for now and will be downloading as soon as I need it. Just wanted to drop by to say that I find it absolutely amazing that you keep working on this even though you haven't gotten all that much (public) feedback. Almost every time I check out my Tracked Mods page, this one is at or near the top because of a new update. I'm still not far enough with my mod to have an immediate need, but I'm absolutely thrilled that when I do, I'll have a tool like this that apparently keeps getting better with each update. Keep it up, that's what I call dedication! Thank you so much. I am pleased to have such a warm word. 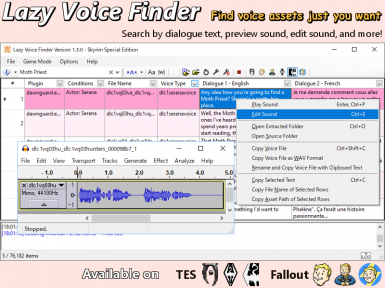 Well, basically this tool is only for mod authors/translators who deal with vanilla voice files, there should be very few potential users. There is no reason for less feedback.